This is the place where Peanut Butter & Co. was born, so of course I’m a little sad to see it close. But the truth is, it’s just sooo small. 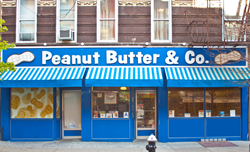 Peanut Butter & Co., a pioneer in the natural specialty food industry, announced today that it will close its eponymous sandwich shop located at 240 Sullivan Street in Greenwich Village, New York. After more than 17 years and well over a million peanut butter sandwiches served, the shop will close on the evening of Sunday, February 21, 2016. Sales of the Company’s signature line of peanut butter, currently sold in over 15,000 supermarkets and natural food stores throughout the United States and abroad, will continue without interruption. The Peanut Butter & Co. Sandwich Shop was opened by company Founder & President Lee Zalben on December 21, 1998 and is credited with launching the single-ingredient restaurant phenomenon in New York City, which now encompasses a myriad of restaurants devoted to single ingredients like macaroni & cheese, meatballs, rice pudding, or lobster rolls, to name just a few. From the shop’s earliest days, Zalben began bottling his ten flavors of all-natural peanut butter and selling them in the shop. By 2000, a buyer from nearby Dean & Deluca insisted on opening up a wholesale account to resell Zalben's peanut butter, something that he hadn’t planned on at the time. The wholesale business flourished, and in 2003 Peanut Butter & Co. built a small factory in the Greenpoint section of Brooklyn. The company produced its peanut butter there until 2006 when production moved to Georgia to be closer to the where the peanuts are farmed. Sales continued to grow, and Peanut Butter & Co. evolved into a leading national brand of natural peanut butter. Over the years the Sandwich Shop racked up numerous accolades including being named a “Top Bang for the Buck” by the Zagat Survey and winning an Eat Out Award from Time Out Magazine. The sandwich shop was also featured in numerous television shows on the Food Network and Travel Channel and was featured in countless guidebooks, newspapers, magazines, and blogs. About Peanut Butter & Co.